Face Illuminator: 9 g / 0.3 OZ. Mascara: 5.7 g / 0.2 OZ. Face Illuminator: Is a multi-use, multidimensional highlighting powder brings customizable light to face, eyes, and décolletage. Caviar Stick Eye Colour: A versatile eyeshadow stick that delivers effortless application, high-impact colour and up to 12-hour wear. Full Blown Mascara: This mascara gives real lashes a thicker, longer, curled appearance with each stroke. Lip Glacé: A high-shine, perfectly pigmented lip-gloss with rich, long-lasting colour, and brilliant shine that creates the appearance of fuller lips. 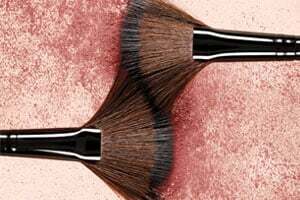 Apply with the Fan Powder Brush and sweep lightly over skin - anywhere you want a subtle glow. Use the Finishing Brush for a sheer, diffused glow, or with the Crème Cheek Colour Brush for targeted high-beam highlighting. Use it wherever you want to highlight or illuminate: on apples of the cheeks, forehead, nose, chin, eyelids, more. A touch of Face Illuminator on décolletage and shoulders adds a beautiful glow all over. This versatile eyeshadow stick delivers effortless application, high-impact colour and up to 12-hour wear. Pigment-rich shade glides seamlessly onto lids. Creamy formula gives you plenty of time to smudge, blend, line, fill or define, so it's easy to create any look. Sets for crease and transfer resistant wear and layers easily over or under other eye shadows (including powder). For best results, work the mascara brush from the root of lashes then wiggle it up through the lashes. Pull the formula out to the very tip of the lashes. Repeat for added volume. Using the wand applicator, glide product all over lips. Apply a light layer for sheer coverage or layer for more intensity.